Oakland Kajukenbo Kwoon is having Youth Program belt promotions and a big party on Saturday April 27th from 8:30am to 1:30pm. All students enrolled in the Youth Program this semester should plan to be at Saint Columba by 8:30am. The testing will run from 8:30am until about Noon and will be followed immediately by a buffet lunch and martial arts party games until about 1:30pm. Belt promotions are an opportunity for a specific group of Oakland Kajukenbo Kwoon students to share their Kajukenbo skills in front of their training community. It is a chance for these students to be seen and celebrated for their power and knowledge. Teen/Adult Program students are welcome to attend and support the testing as well as help make sure the party is festive and fun. Families and community supporters are all welcome to come for any and all of the day. There is a sign up sheet if people want to bring a dish for the buffet lunch or to help to make the day run smoothly. Through this fist way one gains long life and happiness! 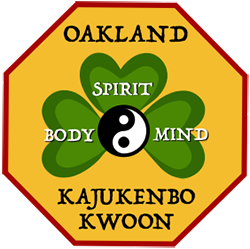 The Saint Columba Hall is not available for Oakland Kajukenbo Kwoon classes on Thursday April 18. Please practice on your own! Pass it on to your network.